hi! 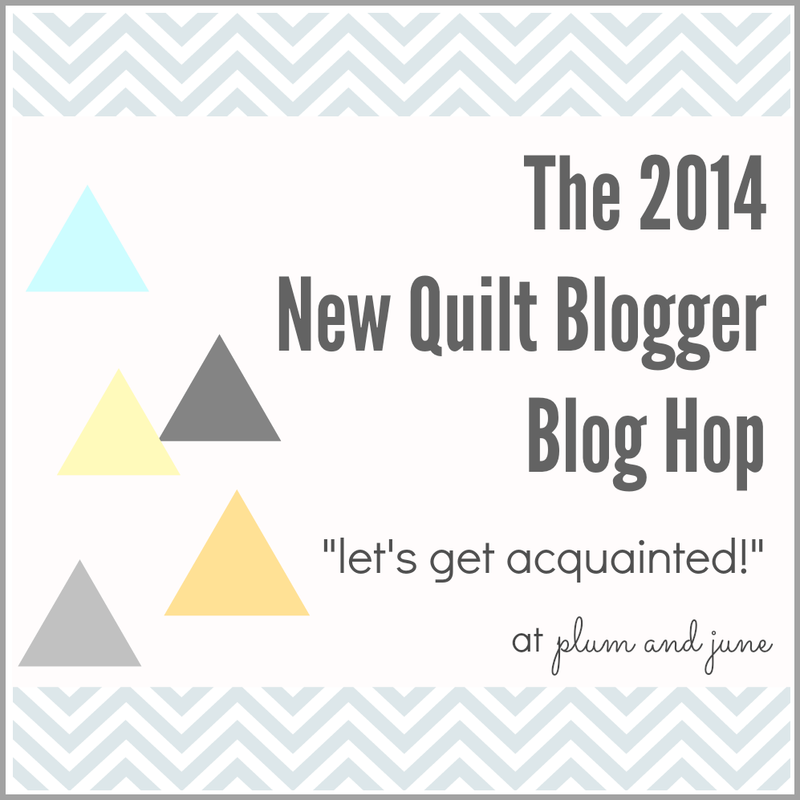 and welcome to my stop on the 2014 new quilt blogger blog hop! i want to give a special thank you to beth, over at plum and june, for organizing and hosting this event, because if it weren’t for her, you may not be reading this right now! my name is christina, and i am a twenty-something year old, born and raised in indianapolis, indiana. (hence the name, “wholesome midwestern.”) i am currently a preschool teacher at head start, which is a federally funded program for low income families. my job is very challenging, yet very rewarding. 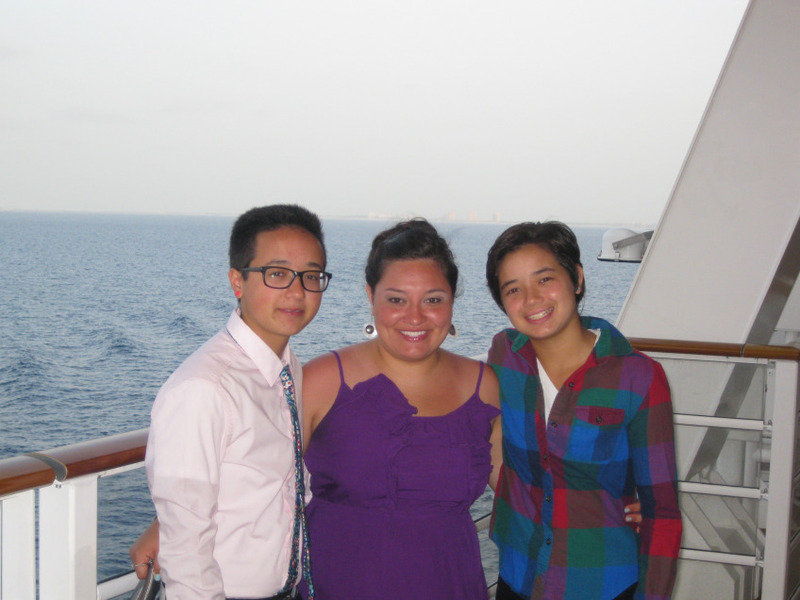 those kiddos sure do keep me on my toes! aside from crafting, i have a younger brother and a younger sister who are my pride and joy. 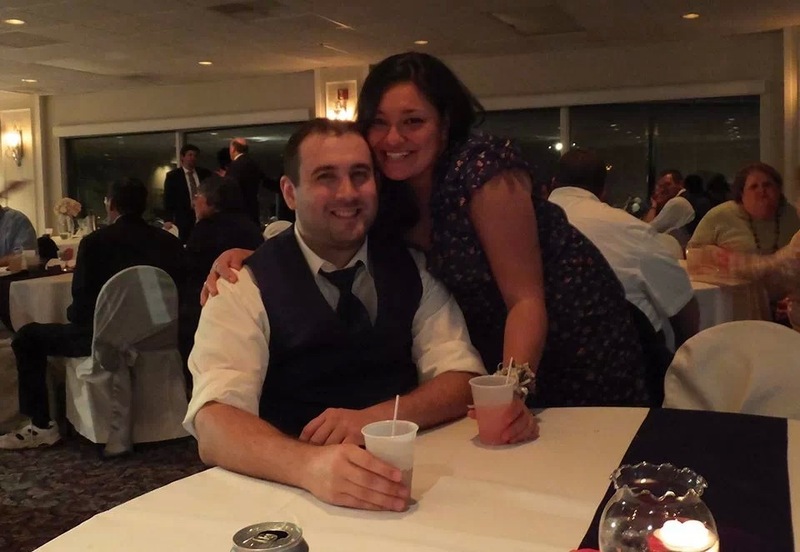 oh yeah, and of course my boyfriend, brian, whom i love dearly. these three characters make my world go round. being artistic and working with one’s hands runs in my family. i, myself, have loved creating since as long as i can remember. i got more serious about art in high school and college, when i started making personalized gifts for people. (which is still my favorite thing to do!) i used to be a huge papercrafter, then i was into “mail art,” but when my mom gave me her old sewing machine, i fell in love with quilting. i’ve had to teach myself everything i know about sewing; from the most basic things, such as threading a machine…to the much more intense, such as binding a quilt (which i still hate doing by the way!) it has been a struggle, but it has also become my favorite past time, and i’m very proud of how much i have learned in such a short amount of time. 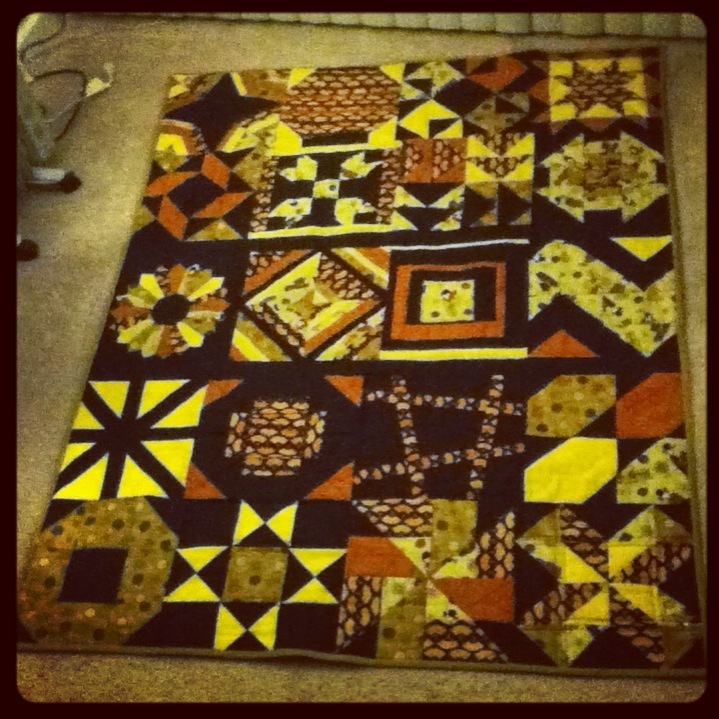 the online quilting community has been an AMAZING help! 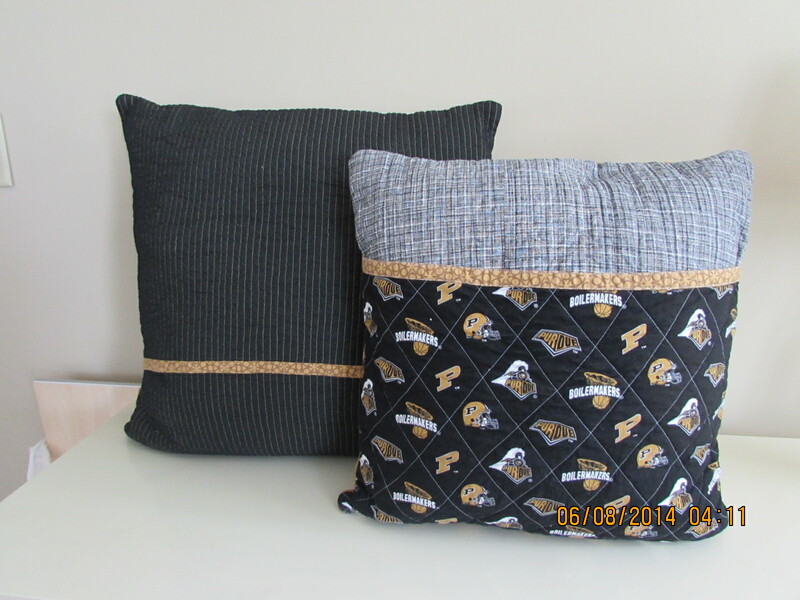 i’ve become a big fan of making pillows…just because they are quick, easy, and so versatile. 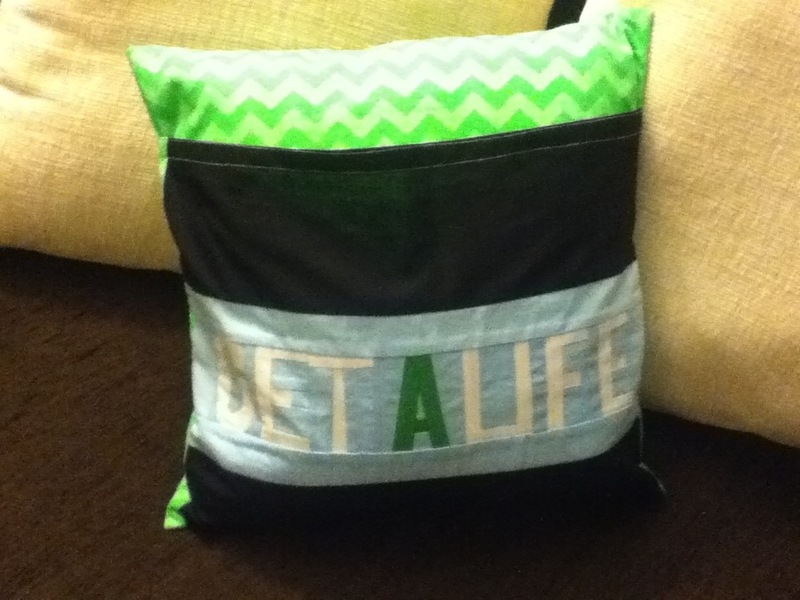 the first is a “one up” pillow i made for brian, for valentine’s day. 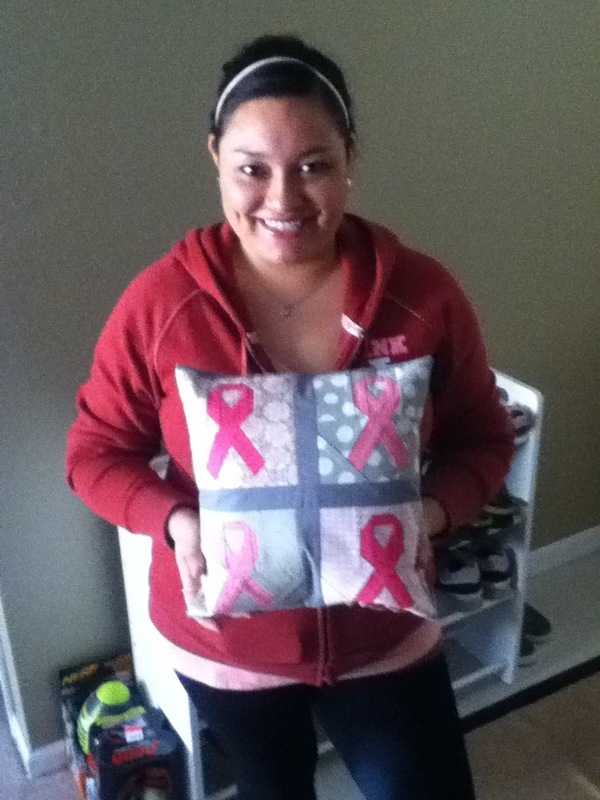 the next is a pillow i made for a good friend when she was diagnosed at a very young age with breast cancer. and the other two i just completed this past weekend, for my sister’s graduation presents. for christmas, i made this blanket for my brother. i was really happy with how it turned out. it was the first time i had used denim, which was difficult because it had a little bit more stretch/give than i was used to. it was also the first time i had used flannel as a backing, and i REALLY loved the weight it added. i washed it on christmas eve, right before giving it to him. it was so warm and crinkly, i almost didn’t have the heart to give it away. being so new to quilting, paper piecing has been a saving grace for me. i love the precision of it. it was a little harder to learn, and can be tedious at times, but the overall result is so worth it in the end. i recently made this mustache quilt for my good friend’s son. there were no nips, tucks, or puckers on the back, and the binding was almost flawless, so it was nice to see my progress coming along. 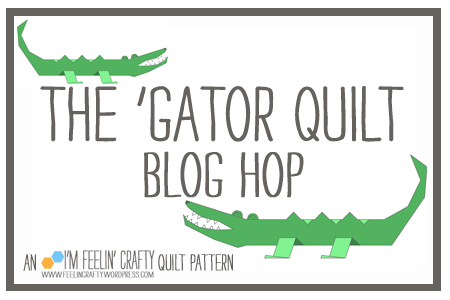 as far as a piece of quilting advice goes…i would have to say that more is more. quilting is an expensive, time consuming hobby, so you’ve got to commit. i learned the hard way that $1.99 a yard broadcloth and cheap thread only wasted time, money, and energy in the end. 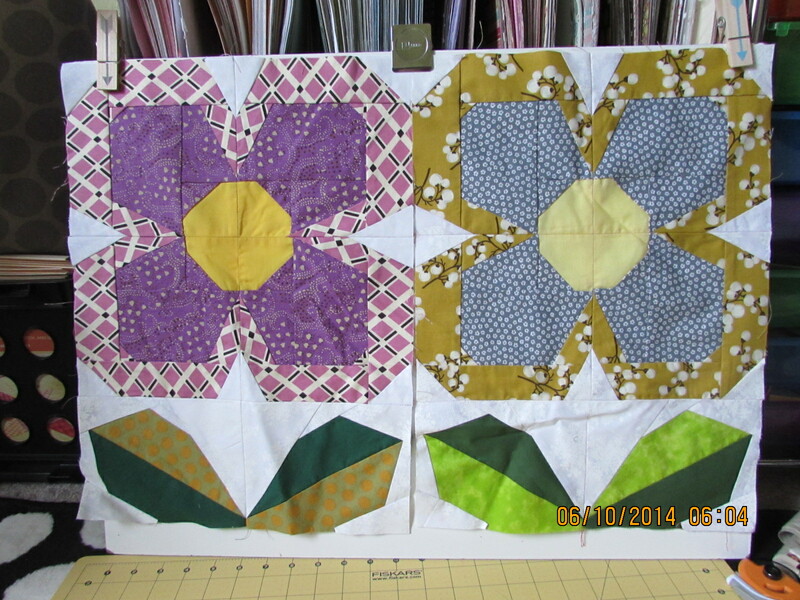 trying to skimp and get by with scraps while paper piecing only lead to frustration. not taking the time to properly stretch and tape down the backing, and/or being too lazy to baste with enough pins, resulted in unwanted puckering. invest in quality products that are going to last you awhile, and know that it takes patience and practice to piece quilts. i’ve been told i’m long winded, so i apologize for being so chatty! but if you’ve stuck with me and made it this far, i certainly appreciate ya! my last interesting tid bit about myself, is that i am an avid reader. however, when i was bitten by the quilting bug, i kind of put books on the back burner. so, in order to get myself going again, i set a personal goal to read 30 new books, before i turn 30 in november. doh! i let the cat out of the bag about my age. if you’d like to read reviews on the books i’ve read thus far, and/or suggest something for me to read next, you can go to this post. 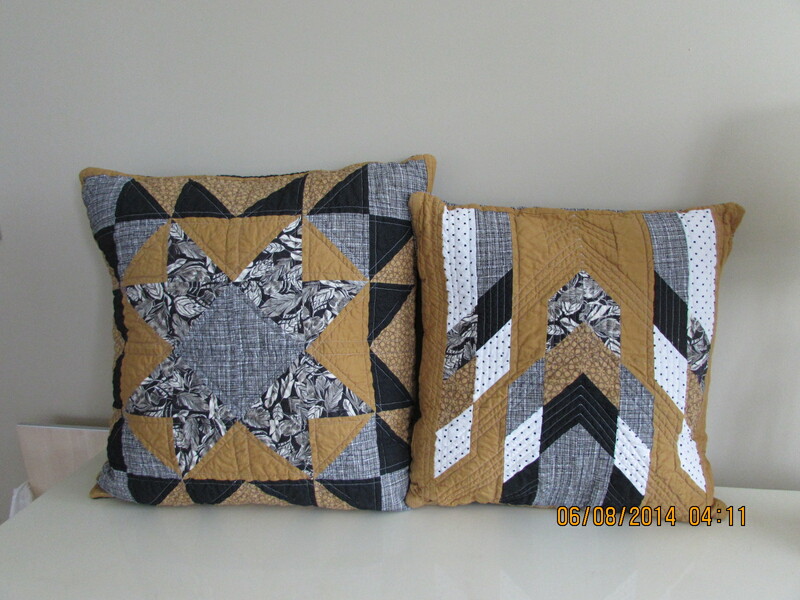 here is a link to the tutorials i have shared thus far, but be aware, they are not all about quilting. 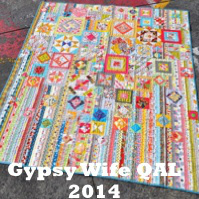 i’d love if you would continue to follow me on my journey to become a stellar quilter! 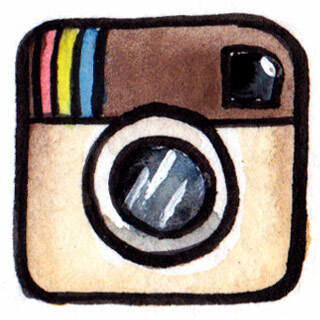 and i’d also love if you would check out my personal, non craft life on my other blog, too! I love your sister’s pillows. Lately, I start with fabric and then decide what to make. I am doing a lot of stash busting this year. thanks! they have become pretty popular in a short amount of time, lol. that is what i need to do! i keep buying faster than i can create. thanks for stopping by! Visiting from 2014NQBH. Your projects are really wonderful. One suggestion, you need a sidebar or a page at the top with links to your tutorials. I wanted to see what you had done based on your blog name, but couldn’t find a way to get to them. It was good to put a link in the post, but new people visiting your home page might not see that link. I love the Mario pillow!! How fun! At the moment, I’m choosing fabric to suit the designs I want to make but I do have two fabric bundles I bought just to have that are telling me what to make! Mario cushion is great! Hi Christina! I really enjoyed getting to know you better. I have been all over the place with my creative process lately. In the past I have been a fabric based person – pick the fabric an let it pick the pattern. Lately, I have been focusing more on the design first and then fabric selection. Both are fun and creative in different ways! 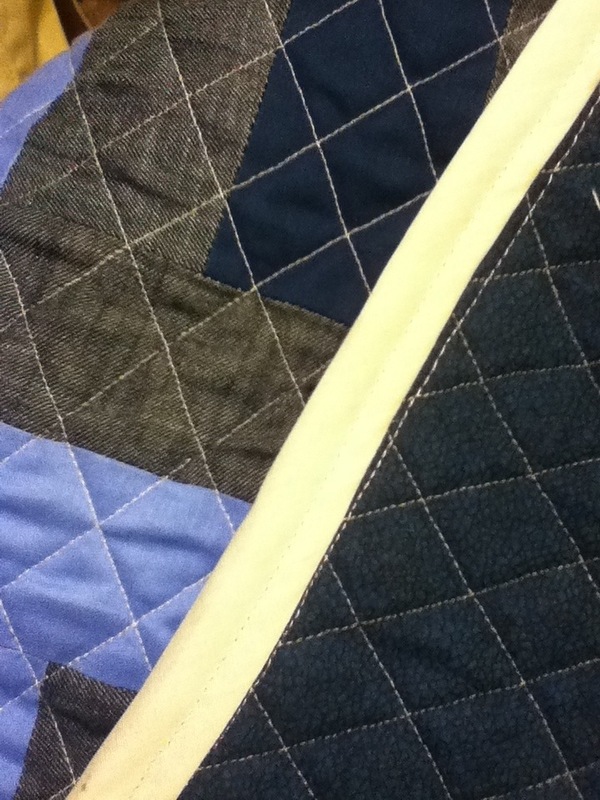 The denim quilt looks great, and I have to admit that I have purposely stayed away from using denim. Maybe it isn’t so scary, after all! A problem I have is I keep being drawn to large scale prints and then can’t find patterns to showcase them. If you plan to use denim I would definitely suggest using interfacing. That’s what I will do if I ever use it again 🙂 thanks for stopping by!! 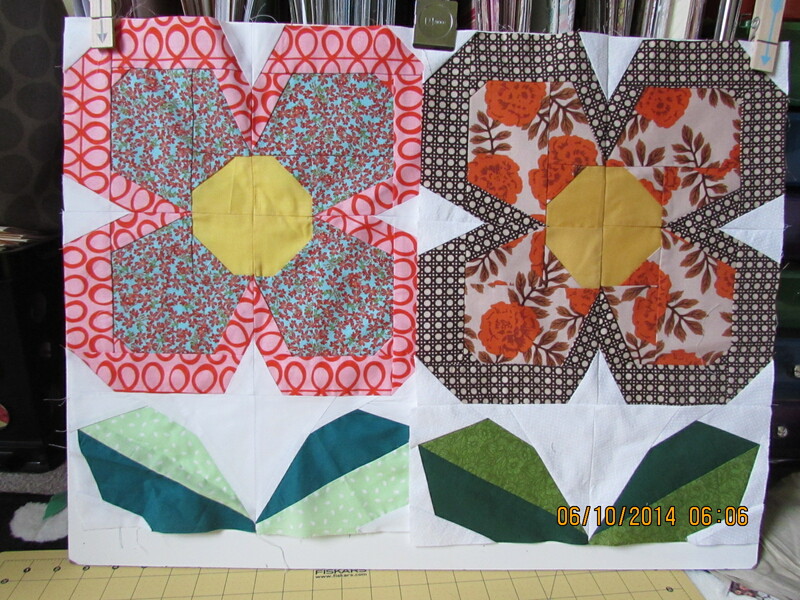 Your large, vintage flower blocks are fun! I tend to buy fabrics I like and eventually combine them into art quilts or quilts. I love to quilt smaller art quilts with both purchased and hand-dyed and printed fabrics. My large projects are usually for someone or to donate – when I make it for someone, it is fun to design with them in mind, when it is to donate, I can have fun with color combinations and designs I love! I love your blog title and your banner, so original and catchy. I’m trying to think about how I go about projects…I usually pick a color scheme, pull some fabrics, peruse pinterest for some inspirational pictures and then start sketching. I like to put a twist on whatever I’m inspired by because copying gets a tad boring for me. Often part way through a quilt, I will tip something on its side or print a whole new pattern onto it. 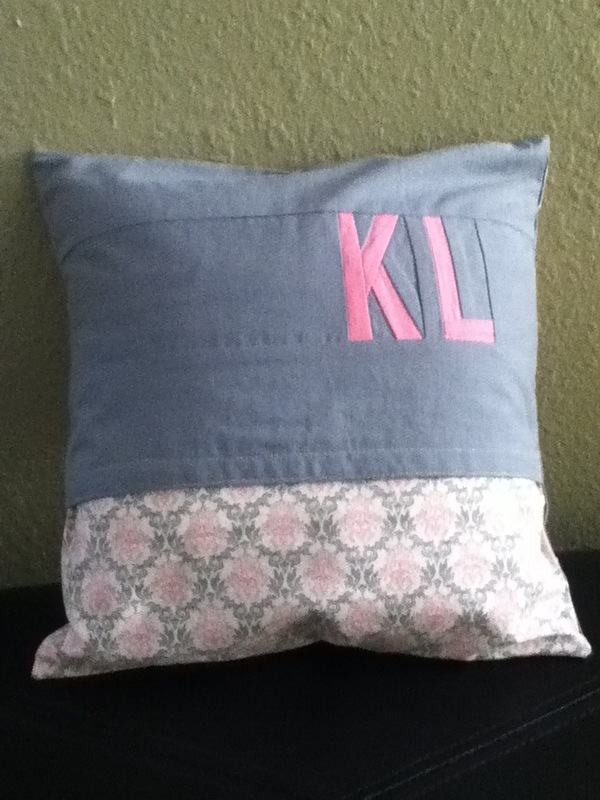 I finished my first pillow a month ago and loved it and the immediate gratification! I look forward to reading tons more from you! 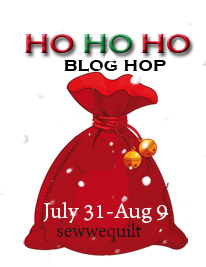 Visiting from the blog hop! My design process is all over the place! I usually end up buying fabric that I can’t resist, but then it takes a while to find the perfect pattern for it. I’m more productive when I pick a pattern first because then I know what fabric I need (in my mind’s eye) to complete it. 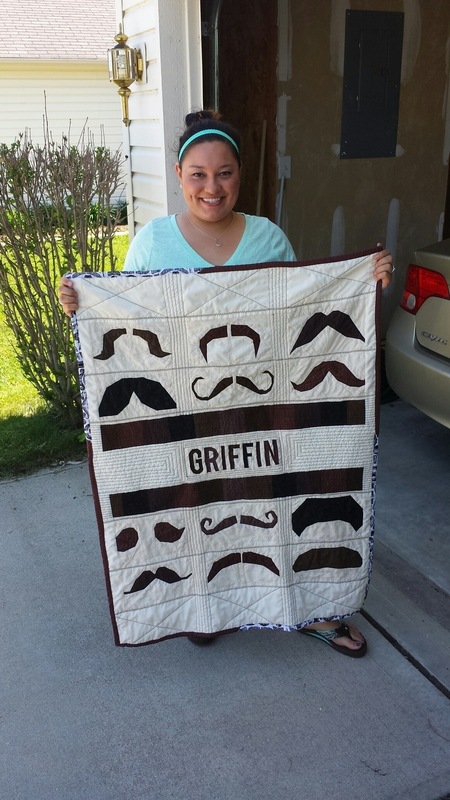 Love the mustache quilt, so cute! 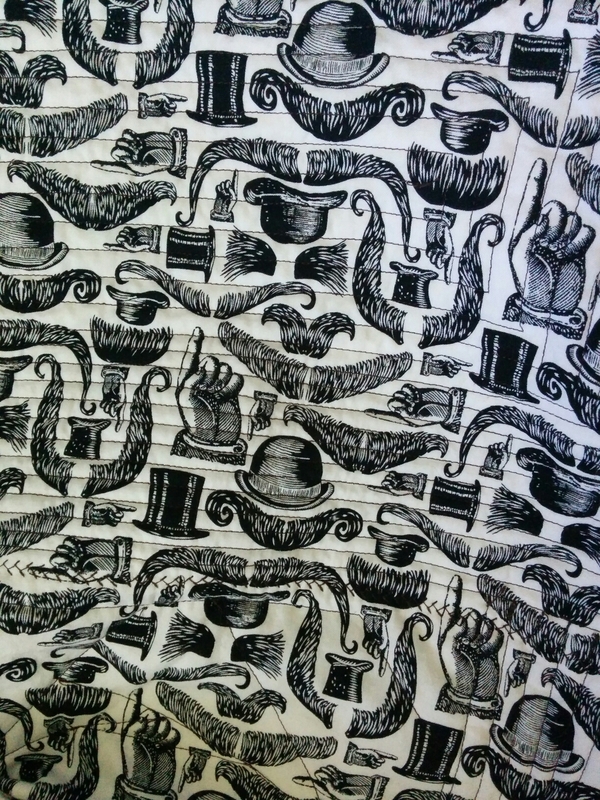 That mustache quilt is so funny! Love the zakka flowers, too, Christina! Your projects are lovely. It’s so nice to know more about you. For my creative process, I usually buy fabric that I love, let it stew for months or years, and then the right project will find the proper fabric. I think the trick is to be picky about the fabric you buy and to buy good blender fabrics too. Nice to meet you! I like those last two pillows the most too. I like to do SALs as they keep me motivated and I need some deadlines. I try to use whatever I have in stash and adjust the pattern accordingly. NIce to meet you on the hop. 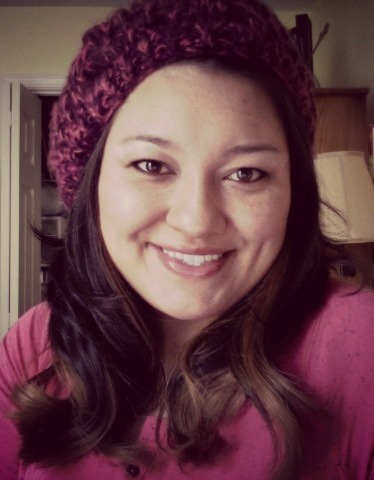 I blogged last week, and had so much fun. Hope you do too. I love your creativity and energy. Working with little ones and is rewarding, but can be exhausting. I was a children’s librarian but now work in adult for the most part. My creative process happens in two ways. 1. I find a fabric that I love. Then look for a pattern where it will be the star of the show, and try use as much of my stash as possible. 2. I find a pattern that I love, and find as many fabrics as I can from my stash to give it my own twist. I participated in my first QAL last year, had fun and learned a lot. I tend to shy away from all paper piecing, which I’ve tried twice. I’m a dyslexic lefty. It’s very tough for others who have those two traits. When I found that out, I didn’t feel like such a clutz anymore. All the other quilting techniques I enjoy, and love learning new ones. Nice to meet you. I just finished a cushion version of the Swedish Bloom yesterday! Snap! I too have always been an avid reader but have found that I read differently now that sewing and knitting have taken over my life. I still read a lot, but the fiction has become lighter because I read much later at night when I am too tired to sew or concentrate on a terribly serious novel. Have you found what you read has changed as much as how much you read? 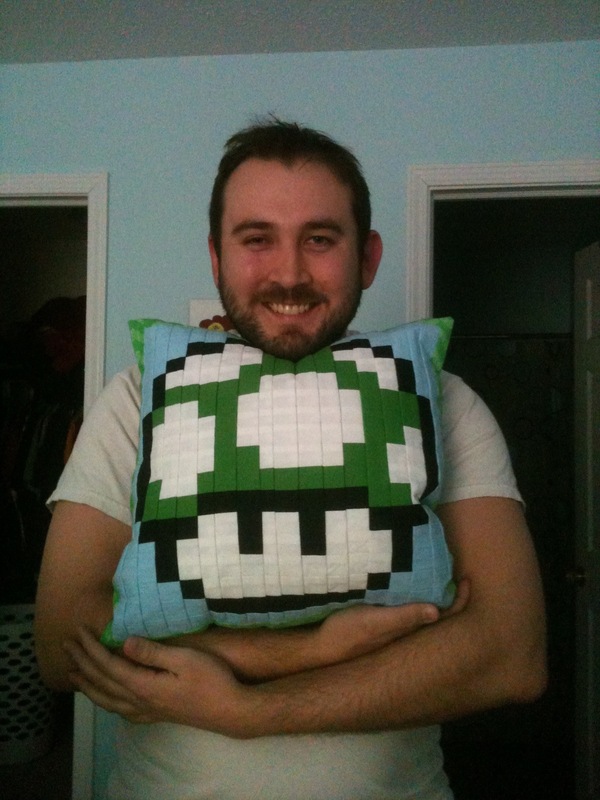 The Mario mushroom pillow is awesome! My son and hubby would LOVE that! Good to meet you! Well I’m chatty too so I thoroughly enjoyed your post and seeing all of your projects. Visiting from 2014NQBH. I think it’s charming to read paragraphs that don’t have a capital first letter and glad you’ve come around to feeling like every post doesn’t have to be blog worthy with professional photos of a finished quilt to present – I get caught up with that myself and it’s nice to be reminded. Not sure if you’d consider this cheating with your book goal but I have friends who compromised and now listen to audio books while they quilt because there just isn’t enough hours in the day to do both! Great post Christina! 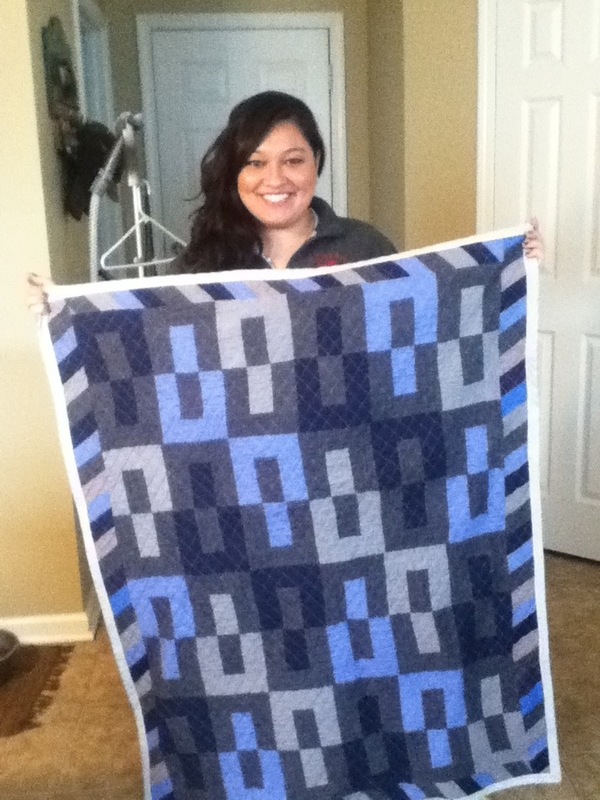 Loved seeing your progression of quilts. My process has to be pattern first, then fabric. I’ve been that way with knitting as well. If I buy yarn or fabric without a pattern in mind, it ends up sitting in my stash not being used. Of course, with fabric it’s much easier to use solids or blenders but it’s those bolder patterns or novelty prints that sit on my shelf since I can’t figure out where to use them. Of course, it doesn’t stop me from buying it! i completely agree! i can think of several novelty prints right now that are just sitting there waiting to be used (cupcakes, peacock feather, etc.) lol. thanks so much for stopping by! Great intro, I LOVE the mustache quilt! I don’t have a very specific creative process, and am pretty new to quilting too! I just pick fabric and hope inspiration will strike by the time I’m ready to start the next project. 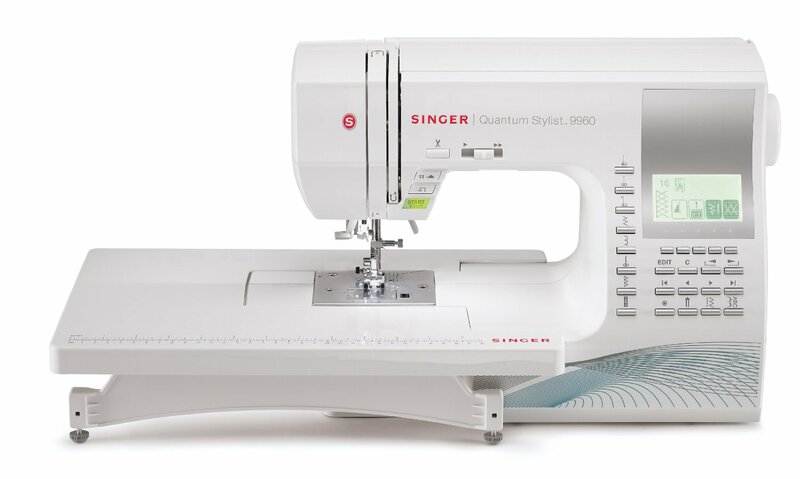 I agree with you regarding quilting tools, having better products really makes a difference, and having fabric I love (not just what’s on clearance ) helps me stay motivated. Nice to meet you! I love your Zakka quilt, probably partly because I’m a big vintage fan. And my son passed behind me as your ‘one up’ pillow was on the screen, and immediately stopped, rushed back and demanded to see what it was! I think he may be about to commision one! 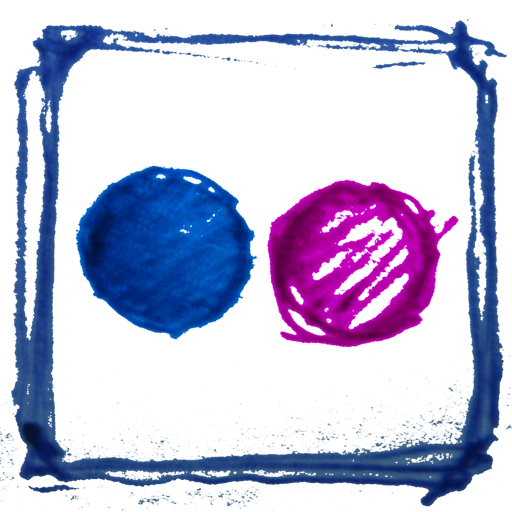 As for creative process, it sort of varies. If the quilt is a present (as they often are!) then definitely I work out from the recipient, I like to make the quilt as personal to them as possible so it’s easier to give away! Otherwise the process is just whatever idea has popped into my head and I can’t resist starting. What great pillows! 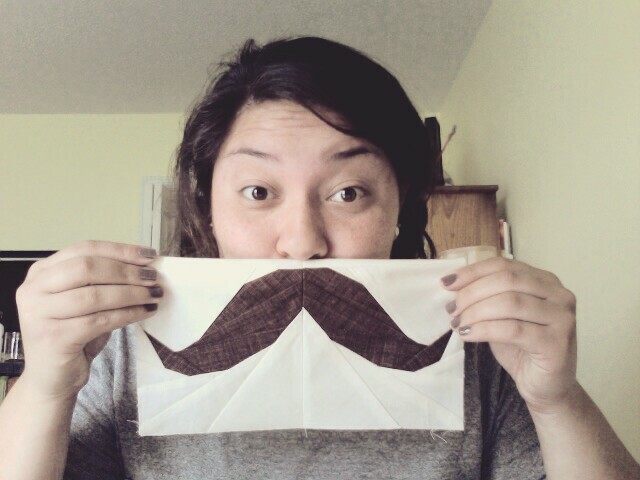 And that mustache quilt is adorable! I love it! Great intro post! I think I’ve tried every possible process you mentioned, from starting with a fabric I wanted to use to just joining in with something. I guess I don’t have a process I use consistently! 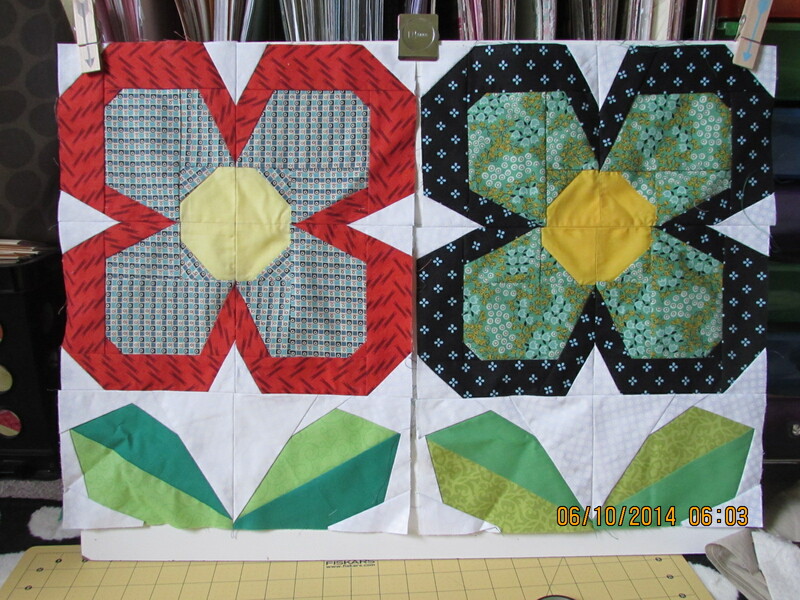 I’m looking forward to working with you on our round robin quilts. Hi, nice to meet you. Love that Zakka quilt! Is it your own pattern? its been fun to meet you. 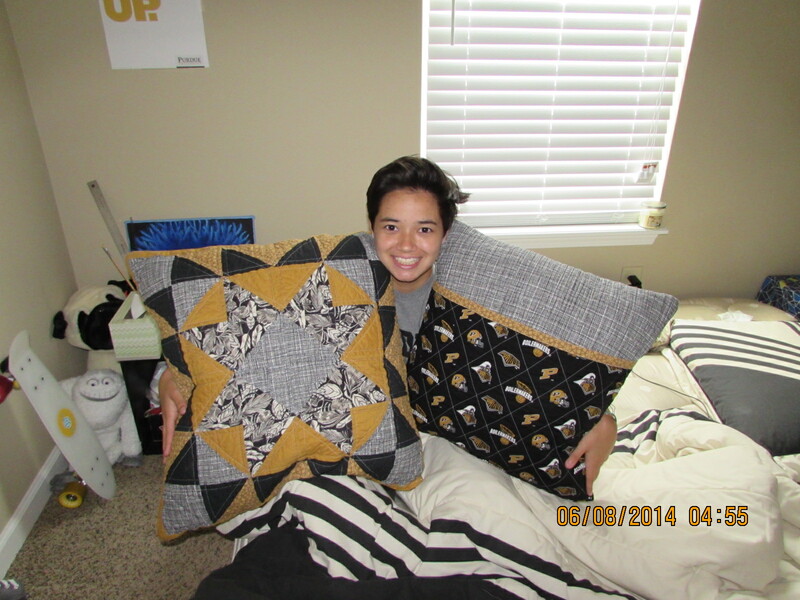 You have made some really fun quilts. I especially like the denim one you made for your brother, and your zakka quilt will be amazing. I think it’s so awesome that most of your projects are for others. I can tell a lot of love and thought goes into them. I don’t think I have a defined creative process. It’s a mix of many of the things you mentioned. Sometimes I see a quilt along or a pattern online that I’m really motivated to do; sometimes I have a definite recipient in mind and set out to make something I know they’ll like, and I do have a few pieces of fabric in my stash that I might eventually get around to creating a quilt around. thank you! those are my favorite…i don’t know if i’ve completed a project just to keep for myself. sad but true lol.